He won the pole vault at the Ontario meet with 13'-6". 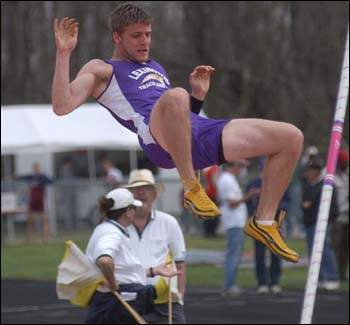 At the Mansfield Sr. meet on April 19th, he set a new school record of 13'-11"
At Marion, he broke his own record and went 14"
May 22nd, he won the Ohio Cardinal Valley Conference championship with a jump of 13'-6". May 24 - finished fourth in the region with 13'-6" vault and qualified for the Div. 1 State Championship. Mansfield News Jounrnal article from fron page of sports section, June 1, 2006. Jumping at the Ohio State High School Championship - cleared 13'-0 and finished 14th. Oh yes, nearly forgot to mention his running events. He was first or second in the 100M dash in nearly every dual meet, and the 4x200m relay team he anchored set a new school record. 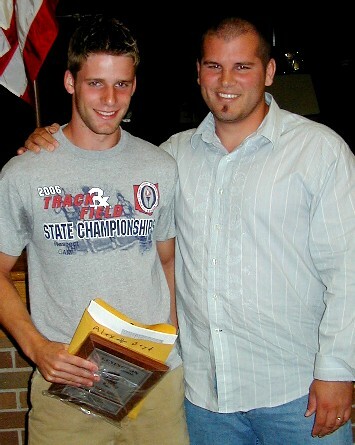 He qualified for regionals in 100m, 4x100m and 4x200m, but the coaches pulled out of all those, not expecting to qualify for State, so that he could focus on pole vaulting. Good call coach!